Free and Open Source RTS Game 0 A.D. Alpha 10 'Jhelum' has been released. This alpha features Hellenic factions such as Athens, Macedonia and Sparta; technologies, civilization phases, click-and-drag walls, healing and more. Civilization Phases: Start in Village, upgrade to Town, then to City. Unlock new techs and expand your territory with each upgrade. Healing units from their battle wounds is now possible by a priest conducting a ceremony with special chants within range. Priests can be trained at the Temple. The Iberians get a pre-built walled settlement as a bonus every game. Basic Technologies: Technologies, or techs, are economic or military bonuses that can be "researched" (bought) for resources at designated buildings. 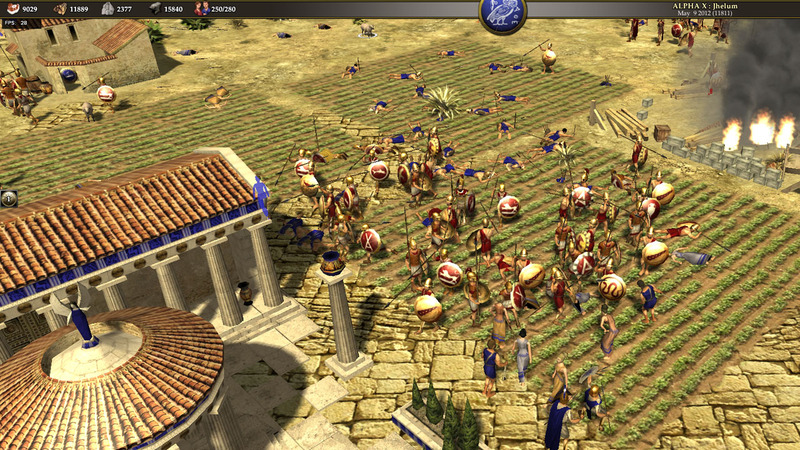 New Hellenic Factions: Athenians, Macedonians and Spartans will now replace the generic Hellenic faction. Each features some unique characteristics along with shared Hellenic units and buildings. "Jhelum" is the Indian name for the Hydaspes River in the Punjab region, and the site of a major battle between Alexander the Great against King Porus of the Hindu Paurava kingdom in 326 BC, located in modern-day Pakistan. Alexander won, but at a heavy cost, and the bravery, war skills and princely attitude of Porus so impressed Alexander, he allowed him to rule Hydaspes in Alexander's name. In honor of the decision to include Mauryan Indians in 0 A.D., we decided to dub Alpha 10 "Jhelum".